There’s no mistaking one of these. It’s a lobster without claws. But what to call it? The common names include spiny lobster, langouste or langosta, crawfish and crayfish. 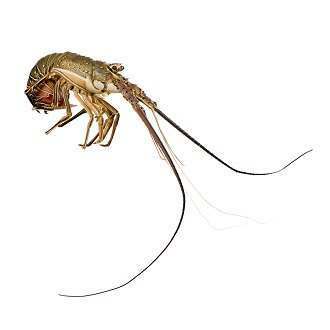 To us, however, a crawfish or crayfish is a smaller lobster (with claws) that lives in rivers and lakes and anything beginning with lango is very likely to be confused with the langoustine, a smaller sea-dwelling lobster which normally becomes scampi (and also has claws). We’re OK with spiny lobster but rock lobster is our name of choice. There are about 60 species. They’re found off most coasts worldwide (down to about 500 metres) but are much more common in warmer waters. 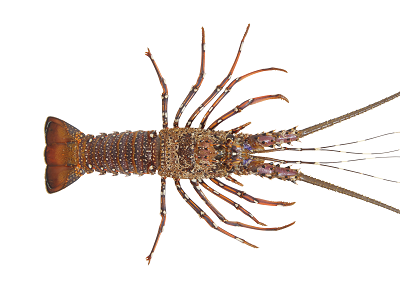 Variants include the slipper lobster, the Moreton Bay bug and the furry lobster. 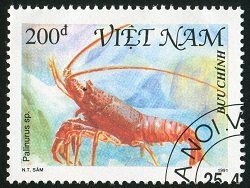 Those three kinds and others are popular local foods but the internationally recognised rock lobsters - normally with two huge antennae - are from two families, the Palinurus and Panulirus (they are anagrams). Those antennae can be twice the body length. In addition to their radar and detection functions, they are a protection device. At their base is plectrum which is moved against a neighbouring body part to produce a loud rasping sound said to deter predators. The antennae are also used in a process akin to holding hands when rock lobsters make seasonal migrations. Communities of 30 or more lobsters move in single file across the sea floor, each follower using its antennae to tag with the lobster ahead. It’s a very touching sight. Rock lobster meat is very similar to the meat of clawed lobsters but it has one great advantage – you’ll never open a rock lobster claw and be disappointed by how little meat it contains. For the chef, clawlessness has several advantages. 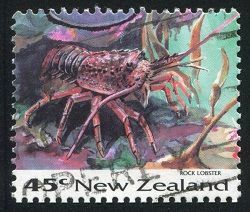 As all the meat of a rock lobster is in its tail, so normally the head is removed at origin and you’re just buying the tail. Removing the meat from just the tail is much easier then removing the meat from a clawed lobster, and the amount of meat per weight bought is much higher (at about 90% compared with about 28% for a clawed lobster) and much more reliable. The Palinurus species occur between Scotland and Africa including most of the Mediterranean. These populations have been heavily fished over the last 100 years and especially from the 1970s when a new technique for catching them - the trammel net – replaced lobster pots. This has resulted in significant declines in populations and landings. For instance in Corsica, the catch was 1,000 tons a year in the 1920s, 350 tons in the 1970s, and around 40 tons in recent years. 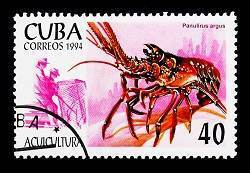 A traditional lobster fishery off Mauritania in Africa was “discovered” by French fishing fleets in the 1950s. They took 3,500 tons in 1961 but within 15 years there were so few lobsters left that there was no point in trying to catch them. However, this species, the Palinurus mauritanicus was very fertile, so the stocks recovered. In 1986, the French boats returned and caught 900 tons. The fishery collapsed again. It’s back in business currently, although at a low level and apparently open only to local fishermen. Fishing by European vessels in Mauritanian waters is now governed by a detailed agreement with the EU which bars them from targeting rock lobster. There’s very little international trade in Palinurus lobsters because they're mainly caught in rich countries which have an insatiable demand for them. Indeed a very large proportion of the catch – which escapes official statistics - is caught by artisanal fisherman and sold to local restaurants. In Greece, the officially recorded landings in the 1990s were 23 tons, but it’s estimated landings sold to local restaurants without being recorded approached 200 tons. The inaccuracy in records due to unrecorded landings is a major problem in the management of rock lobster fisheries. The Panulirus genus comprises about 20 species. These are found off all tropical and near tropical coasts. Some species are quite localised. For instance Panulirus argus also known as the Caribbean spiny lobster is found from Florida down to Brazil and the Panulirus interruptus or Californian spiny lobster off California and Mexico. There’s also an Easter Island spiny lobster, a Japanese, a Hawaiian and a Chinese. However, the blue spiny lobster is found across a huge range between the whole western coast of Africa and a line between Japan and the tiny islands of the south Pacific. The long-legged spiny lobster shares much of the same territory. 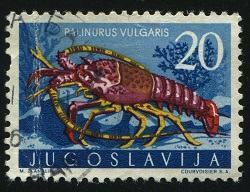 Most rock lobsters imported to Europe are Panulirus argus, the Caribbean rock lobster. This is the species we normally sell. This fishery is split between a dozen countries led by Cuba, the Bahamas, Brazil, Nicaragua and Honduras. Regulation is poor in most of these countries except Cuba where the government determines the annual catch on the basis of scientific advice and in recent years has firmly reduced the catch. The other source of strict regulation is the USA where the Florida fishery having been heavily overfished in the past is now quite well protected although the catch has yet to recover. The total catch amongst all these countries is around 35,000 metric tons a year, the great majority of which is exported to the USA. This is of course an immensely valuable trade worth hundreds of millions of dollars a year of which a significant proportion is sourced from illegal, unregulated or unreported fishing. However, as it is increasingly recognised that better management is essential to ensure the future of this valuable resource, efforts in this direction are beginning to appear. Brazil for instance has announced several fisheries improvement plans in recent years, although enforcement has been poor so far. 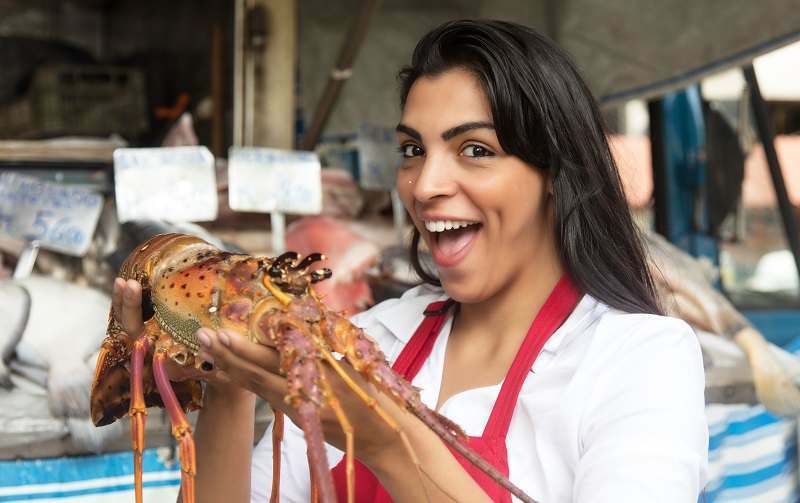 In December 2018, the Seafood Watch Programme of the Monterey Bay Aquarium (a significant player in marine conservation) issued a detailed report on the Brazilian rock lobster fishery which judged that although stocks are probably stable, consumers should avoid eating this fish. 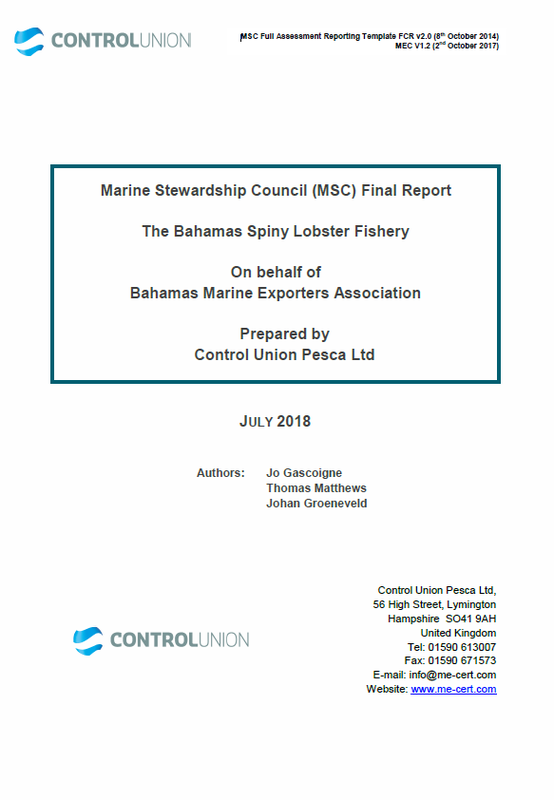 On the other hand, in July 2018 following a ten year programme managed by WWF and local agencies, the Marine Stewardship Council certified the Bahamian rock lobster fishery, recognising it to be sustainable, with good management. Four other rock lobster fisheries around the world including Pacific Mexico and Western Australia have MSC certification.